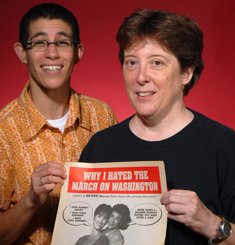 Debbie Gould participated in ACT UP/Chicago for 6 years and was a founding member of Queer to the Left. She currently is part of Feel Tank Chicago. She teaches in the Sociology Department at the University of Pittsburgh and is finishing a book that explores how emotion shaped lesbian/gay/queer political responses to the AIDS epidemic, focusing in particular on the emergence, development, and decline of ACT UP. Mary Patten is a visual artist, videomaker, writer, educator, occasional curator, and long-time community/political activist. Her art work crosses many media – installation, video, photography, artists’ books, graphic arts, and public, collaborative projects. She has exhibited her installations and videos internationally and locally. Her writing – experimental non-fiction, visual essays, and poetry – has been published in both print and web platforms, including AREA Chicago, The Passionate Camera ( Ed. Deborah Bright, Routledge, 1998 ) , and Amazon Poetry. She has lectured widely about the problematic relationship between art and politics, lesbian representation ( s ) in visual culture, queer theory and “new feminisms,” terrorism, prison and repression. Curatorial projects includes Pathogeographies ( 2007 ) , Depression: What is it Good For? ( 2004 ) , Project Enduring Look ( 2002 ) , and RIOT GRRRANDMAS!!! ( 1997 ) . From 1993-96, she edited WhiteWalls, a Journal of Language and Art. Collaborations include Feel Tank Chicago ( 2000-present ) , Artists’ Call vs. Intervention in Central America ( 1984-5 ) , and the Madame Binh Graphics collective ( 1976-1983 ) . Patten was active in D.A.G.M.A.R. ( Dykes And Gay Men Against Racism/Repression/the Right Wing/Reagan, etc. ) , the first activist group to address HIV/AIDS issues in Chicago. DAGMAR’s first public action was a 24-hour vigil and civil disobedience at then-Governor Thompson’s residence in August 1987 to protest discriminatory policies against people with HIV/AIDS. She was subsequently a member of CFAR ( Chicago for AIDS Rights ) , and one of the founding members of ACT-UP/Chicago. There she worked with the Women’s Caucus and the People of Color Caucus to organize the direct action and civil disobedience at the National Actions for Healthcare in Chicago in April 1990, which resulted in the opening of the AIDS ward at Cook County Hospital to women. She also co-designed three ACT UP Chicago billboards, featured in Randolph St. Gallery and Group Material’s “Your message here” ( 1990 ) , and the infamous ( and best-selling ) “Power Breakfast” T-shirt. She teaches in the Film, Video, and New Media Department at the School of the Art Institute of Chicago.